Congratulations. Your paper has just been published! Now, tell the world about it! In the Jurassic, pre-internet era, the odyssey of publishing a paper would end when the said paper was, well…published. The authors were informed of the fact and would get a package with printed copies. Eventually, eager requests for reprints would start coming in the mail. And that was lovely and restful. Now the odyssey starts once the paper has been published online, usually on the Early View section. I just spent most of my morning going through all the steps that, hopefully, will give my most recent publication the best shot at being noted…and I am exhausted! 1. Online CV: I am using Live Career, which does a good job in terms of personalization of fields, but the formattings are not stable and, sometimes, the online versions are a bit messed up. Plus, to be able to download the CV as a PDF or a Word/RichText document one has to pay a yearly fee. So, overall, not great. Suggestions for alternatives are welcome. 2. University online tools: This step is crucial because items not logged on the University system do not officially exist. This system includes my personal University research webpage, the institutional repository to which we have to add all the outputs, and the database of current and historic research outputs which will aggregate all relevant information for performance assessments and promotions. It is vital that these are, at all times, updated to the latest detail. 3. Mendeley: I use Mendeley as my one and only reference manager system and I love it. I don’t see myself going back to any other. I use it all the time for research writing purposes, PhD supervisions, and reading lists for teaching and engagement. Mendeley is brilliant for research discussions in shared closed environments. 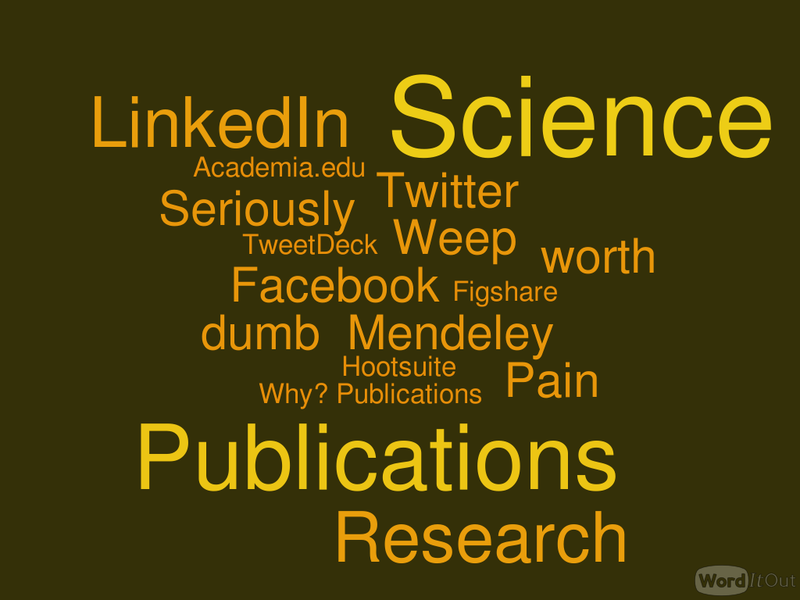 However, Mendeley is also an academic social network that provides a public research profile and that’s where I fail. The public profile needs regular updating and a considerable amount of LTC, which I haven’t been able to provide. Boo! 4. LinkedIn: We are all on it, whether we like it or not! And I don’t particularly like it because it’s a time sucker. There is not a way to just drag and drop the pdfs of the new publications, the information needs to be added one field at a time and it makes me ask incessantly why? why? why?…And I always weep for a while before getting back in the saddle and move on to the next one. 5. ResearchGate: Is a social network for academics, scientists and researchers that never ceases to surprise me. It scores me in many different ways, asks me about my co-authors, allows for intense downloading, is the royalty of endorsements and it is not picky or annoying. It floats around me without interfering too much and it has provided, in many occasions, useful bits of information, new contacts and great research papers that otherwise would go unnoticed. Well done! 6. Figshare: Holds mysteries way beyond my understanding and, as a consequence, I have a crappy profile and a bunch of badly organized resources. 7. Academia.edu: I am not sure how I ended up with an active account here but I do have one and people download stuff from it. There is always someone, in a distant land, looking at my profile. Every week I receive an email telling me which of my papers got downloaded the most! Who can shed some light on this one? And then I weep a bit more! ResearchGate just got an updated version full of lovely features, including the attribution of a DOI to anything we add to the profile – even unpublished materials, such as PDFs of posters and Powerpoint Presentations. I am wondering now if I need Figshare at all. Probably not! Any hints on this?